Where? Which trees? What for? By who? Who support? Who regulates? Who oppose? Research on genetically engineered trees is being currently carried out in a number of countries and yours can be one of them! 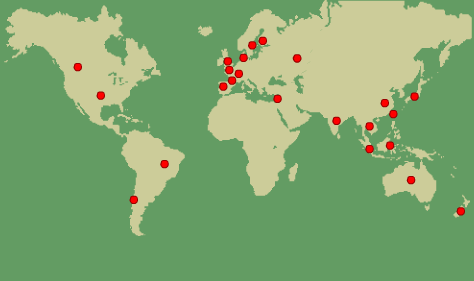 WRM has produced information sheets on the countries where we know that GE tree research -in many cases including field trials- is taking place. The sheets contain information on the species being manipulated and with what aim, on those carrying out the research and those who support it, on the regulatory framework for research and field trials and on the organizations actively opposing this activity at the national level. With this information we aim at raising awareness about this issue and at establishing a two-way information flow with people and organizations opposing GE trees in these countries. You can assist us in improving and updating the information sheets by sending us relevant information. You can use these sheets and adapt them to your own reality and, more importantly, you can get in contact with the local organizations opposing this new threat.